You might think that it’s strange or unusual, especially when you live in a place with harsh winters like Massachusetts, but there are a few people in my neighborhood who consider roof replacement in the middle of winter. Although you know that roofing contractors in the area provide their services all year round, it will not stop you from wondering why they also prefer doing the job during winter, despite the cold weather and snow. To roofing contractors and their crew, doing their job during winter is much like doing it any time of the year, though with some exceptions. Before anything else, let us get to know first the reasons that make roofing a tough job during this time of the year. The weather is too cold for doing a roof replacement. Well, this argument seems to be pointless. If the crew doesn’t mind doing the job even if it is too cold outside, then no one is stopping you to push through. Worrying about the crew doing the installation is actually the least of your concerns. For, first, if the cold weather condition troubles them, they would not have chosen to work on roofing companies that provide services 365 days a year and for, second, most of them actually prefer doing the roofing job winter rather than doing it under the scorching heat of the sun during summer. Temperature in Massachusetts during summer reaches 90 degrees and 110 degrees Fahrenheit, on the ground and up to the roof, respectively. Where’s the fun in it? Too much snow on the roof does not allow replacement now. Removing snow off your roof may take roofing contractors some time and most of them don’t actually get paid extra. They won’t mind doing it as long as they can get replace the roof after. However, it is already their responsibility to exercise due care to avoid falling. Well, they are professionals from a responsible roofing company, thus they know that safety always has the highest priority. Roof leaks due to ice dam. This is one of the most common causes of roof leaks. They are formed from built up snow that melted and run down the roof, just to freeze again at the roof line’s very edge. Contractors in Massachusetts and other cold areas, use “ice and water barrier” along with proper techniques on drip-edge flashing to stop ice dams from causing damage to your home and leaks to your roof in the future. 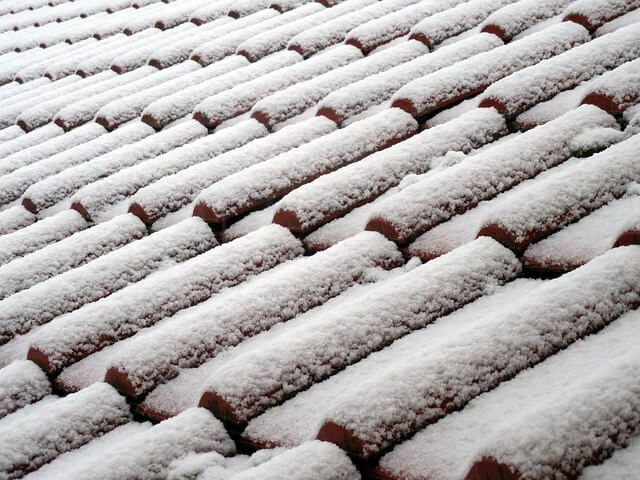 Winter can worsen a bad roof. Other than ice dams, other common factor for having bad roofs is the expansion and contraction of the roof itself due to the varying temperatures of different seasons. These cause shingles to curl and crack, and going through the same cycle each year will soon damage your roof. Service for installation of your new roof is faster. Contractors are generally not busy during this time, so you can get the roof contractor schedule you an installation in just a matter of days, not weeks or even months. Enjoy savings by taking advantage of the off-peak season for roofers. Winter is a slow time for roofers because of less demand from customers. Roofing contractors tend to lower down their rates to attract customers and make their crew busy.